You are currently browsing the Archaeofacts.com archives of Musings for the day Wednesday, June 27th, 2018. As I put skin cream on them earlier, I thought a bit about hangnails. Not a hot topic, I know, but they are curious things…a little extra skin growth, not enclosing the body as it normally does. Somehow, when you clip off the hangnail and cease antagonizing the area, it’ll go back to being flat skin. Me, I get hangnails when I do a lot of cooking/cleaning and my hands are wet, kinda-wet, damp, a bit dry, that kind of thing for a while. We did a bunch of cooking on Sunday and Monday, and presto! I have hangnails all over. They’re healing, however, as I’ve kept my hands out of water (mostly) since Monday…and also the cream. So, I’ll try for a tenuous parallel: the aphids are so dense on some of the lupines that there is a sap-fall on the leaves…at least, that’s my interpretation of this scenario. 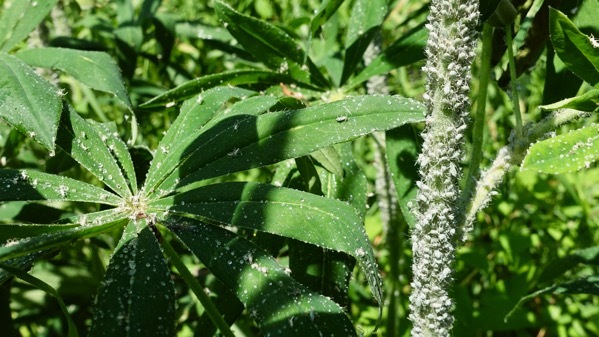 The parallel falls apart when you consider that this lupine’s aphid density is ever so much higher than my hangnail count, and thus the affliction is a greater problem for the lupine(?). Out of curiosity, do other primates suffer from hangnails?